If you are working in a hazardous environment or with hazardous materials such as open flames, electrical equipment, or combustible materials, you may want to consider FR garments as a precautionary measure for on the job safety. In addition to our uniform rental services, Lord Baltimore also provides flame retardant garments for employees in various industries. As a necessary safety measure for so many employees, flame retardant garments are crucial to the jobs of many individuals working in high risk or hazardous environments, such as electricians, factory workers, and employees working with flammable materials throughout the day. If you are a business owner looking to provide new and safe uniforms for your employees, consider these three FAQs regarding flame retardant garments. 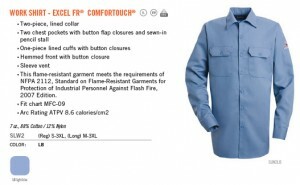 Do I Need flame retardant Garments for My Job? If you are working in a hazardous environment or with hazardous materials such as open flames, electrical equipment, or combustible materials, you may want to consider FR garments as a precautionary measure for on the job safety. These garments act as a buffer between your body and these hazards to ensure that minimal damage is done to your skin in a burn risk. While these garments are excellent for slowing and minimizing injury, it should be noted that they cannot completely extinguish or eliminate a fire. What is are ATPV and EBT Arc Ratings? The Arc rating of a flame retardant garment is based on its Arc Thermal Performance Value (ATPV) or Energy Breakopen Threshold (EBT), which are the primary indicators for the level of protection that the garment would provide in a fire. These ratings are especially important because they distinguish the FR garments based on their thresholds either during or before breakopen, when a fire can cause a second degree burn. As you choose FR garments for your employees, it is especially important to keep the Arc rating of these garments in mind to purchase the proper uniforms that will provide the best protection to your team on the job. How Can I Check Which FRCs are Necessary for Compliance? In order to check which FR garments are necessary for compliance in your job, consult the NFPAs 70E Informational Note in order to determine which FR garments are best suited for you. At Lord Baltimore, we offer FR garments manufactured by Bulwark Protective Apparel for the highest quality garments available. Our uniforms are available to rent, lease, or purchase throughout the year, and our team of experts are ready to help you choose the best uniforms to protect you and your team on the job. To learn more about how flame retardant garments can keep you and your team safe on the job, please contact Joe Bateman at Lord Baltimore by calling 800-292-1224 or visit LordBaltimoreUniform.com. We also handle towel rental for gyms and salons, as well as apron, towel, uniform and mat rental and purchase for restaurants. Additionally, we also sell and rent uniforms, shop towels, fender covers and mats for manufacturing and automotive industries. This entry was posted on Friday, March 2nd, 2018	at 9:02 am	. You can follow any responses to this entry through the RSS 2.0	feed. Both comments and pings are currently closed.